Are you worried that walking your Valentine's Day bouquet from the car to the house will make the blooms shrivel from the frigid weather? Add handmade roses to your gift wishlist instead and you won't have to watch them wither away. Whether made from silk or leather, flowers will stay beautiful even on the coldest of days. 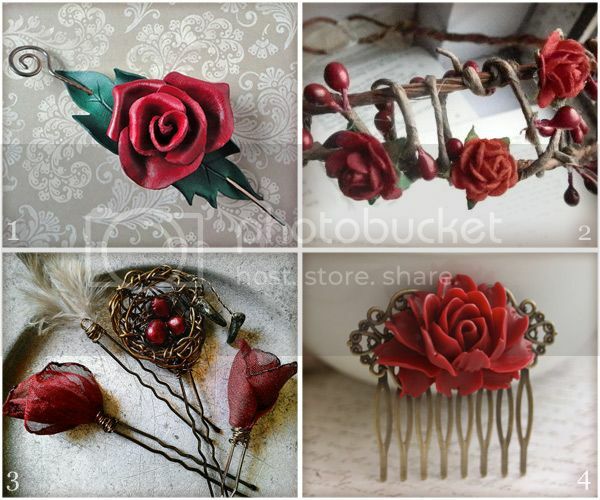 Today I took a stroll through the fabricated florists of Etsy in search of red rose hair accessories. Trying to pick my favorite flower to wear on a romantic date was a daunting duty. There are fields upon fields of pretty options, from hair slide barrettes to bridal crowns to vintage hair jewelry. lovely!! Been thinking about needing some red hair jewelry!